Music sneaks up on us occasionally. I love it when it does. I'm astonished when I meet someone who doesn't really pay much attention to the music around him or her. What I especially love is hearing a piece of music I think is one thing, but it turns out to be something else. 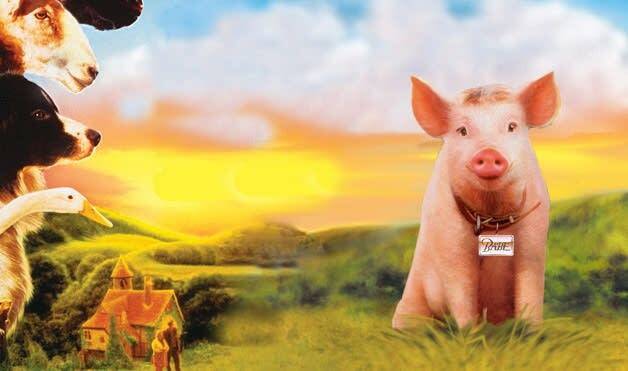 Babe opened in theaters in 1995, but I didn't see it until it came out on video a year or so later. I noticed the soundtrack immediately, reminding myself to check the end credits for who composed the music. I thought it had either been composed by a contemporary composer or was perhaps taken from Mendelssohn: it sounded like the Reformation Symphony. The musical theme during the opening credits set a triumphant, upbeat, joyful mood, and continued to pop up throughout the movie. I really wanted to know what that music was. Nowadays, I'd power up my laptop, go online, and look it up on IMDb. Then I'd do a search on the piece to find a music video of it. In 1996, I waited until the closing credits to find out who composed the music. There were quite a few pieces used in this movie, both popular music and classical. For example, the Toreador Song from Carmen by George Bizet, a piece I knew. Then Cantique de Jean Racine by Gabriel Faure, a work I didn't know. Maybe Faure's music was that wonderful theme. But there was also the fourth movement of Camille Saint-Saens's Third Symphony, the "Organ Symphony." I didn't know this piece either. When I heard it I wondered, was it Faure or Saint-Saens? James Cromwell, as Farmer Hoggett in the movie, sings lyrics set to the opening theme. This song invaded my mind as an earworm, keeping me humming for days. I thought of visiting the library to see if I could find recordings of the two pieces. At the time I was busy doing research for a book, and for a while, I forgot about the music theme. It would be nearly a year before I answered the question of Faure or Saint-Saens. That answer came with help. I was working on my writing one day, listening to Classical MPR in the background, when I heard that mystery music coming from my radio. I turned up the volume. Wow. An organ played the theme. I had my answer. The theme belonged to Saint-Saens's Third Symphony. The theme in Babe had given me only a taste of what Saint-Saens had written — not only in the final movement of the Third Symphony, but in the other three movements as well, including two or three more familiar themes that I hadn't known belonged to this symphony. What surprise for such a serious symphonic work to show up as the main musical theme in a family movie. This music had sneaked up on me. That left Gabriel Faure's Cantique de Jean Racine. Would you believe that I did not think about that piece again until I was researching this essay? It's well-worth a listen — perhaps it will "sneak up" on you! Cinda Yager writes essays, fiction, and two blogs in Minneapolis. She loves classical music and has just published an e-book novel set in the classical music world, Perceval's Secret.